Water plays a vital role in the health of lawns and plants. With too little or too much water your lawn and plants fail to thrive. 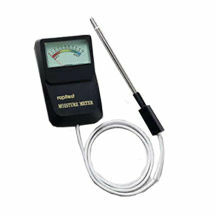 Our easy-to-read moisture meter starts working the instant the probe is inserted in the soil. The gauge indicates the moisture level from 1 to 10. Handy moisture guide shows optimum moisture levels for common lawns, garden and household plants. No batteries needed.